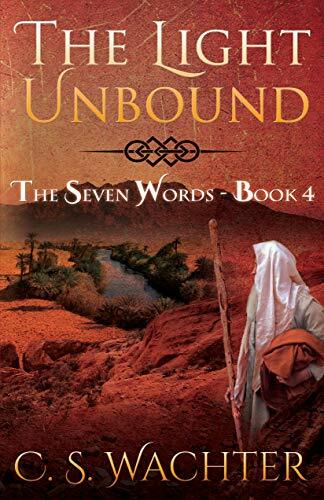 The Light Unbound is the 4th and final book of C.S.Wachter’s The Seven Words series. It is YA/Adult Fantasy. Prince Rayne again falls prey to the evil Sigmund and in his frustration turns his back on the One and what he was called to do. Then he meets a child-like ancient, named Mite, who helps Rayne find anonymity in the Camp of the Forgotten. In the meantime, his friends try to figure out why Prince Rayne is behaving in ways that are totally contradictory to his true character. Lexi struggles most as she wants to believe in Rayne, but something just doesn’t seem right. There is also a black cloud approaching across the Cameron Sea, and mind-altering shadows threatening all Ochen. And when members of the Interplanetary Council die from a mysterious illness, the young prince declares himself Imperial Emperor of all Ochen, leaving all of his friends confused and questioning—is this really Rayne, or could it be someone, some-thing else? This installment of The Seven Words series does not disappoint. It is just as good as the first three and kept me turning pages in anticipation of Rayne’s friends finding out the truth, and also cheering Rayne on to turn back to his faith. The characters, both old and new, help to move the story along. Some create conflict and tension while others add a bit of humor to the intense story line. By the end of this book, C.S.Wachter does a great job of making clear connections between all four books and resolving all of the conflicts from all of the story lines. The ending is very satisfying, and many of the characters will live on in my mind for a long time to come. This has become and will remain one of my favorite fantasy series, and if you enjoy good fantasy reads, I highly recommend them.